To Phillis Skinner, suffragist, author, socialist. From Ali Ronan. 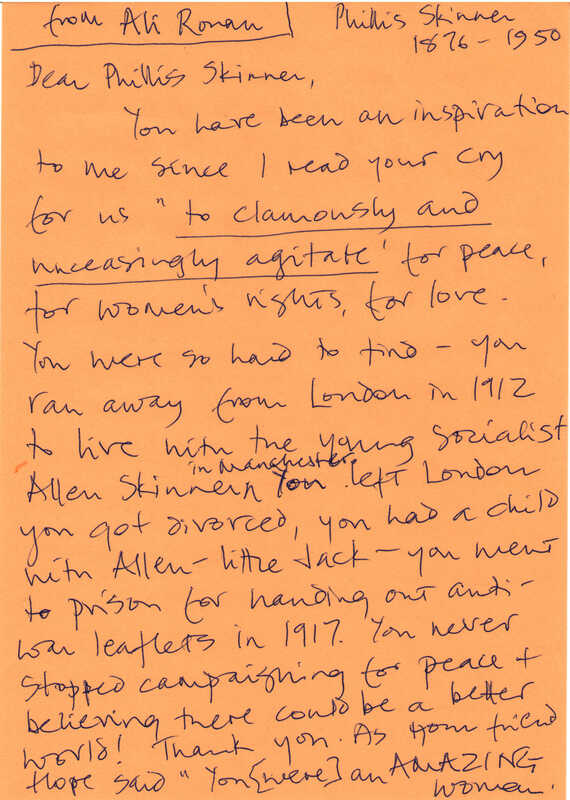 Dear Phillis Skinner, You have been an inspiration to me since I read your cry for us “to clamorously and unceasingly agitate” for peace, for women’s rights, for love. You were so hard to find – you ran away from London in 1912 to live with the young socialist Allen Skinner in Manchester. You left London, you got divorced, you had a child with Allen - little Jack - you went to prison for handing out anti-war leaflets in 1917. You never stopped campaigning for peace + believing there could be a better world! Thank you. As your friend Hope said: " You (were) an AMAZING woman." suffragist, author, socialist. Born 1876, died 1950. More information about Phillis Skinner.